← And so we embark upon 2013. 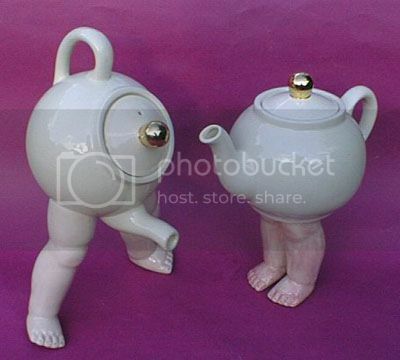 Without proper description, characters may as well be teapots. We had 3 new members at this month’s meeting, and I was so pleased to see 2 of the 3 new people from February weren’t put off; not only coming for a second helping, but both added to our submission pool for this month. We ended up with 14 in attendance and 7 submitting members to critique. To give everyone a fair chance we introduced timed critiques for the first time, and it worked out really well. Our take away lesson this month was to add description to characters, especially in a crowd situation, so it gives the reader a more real experience. The member who was pointing this out during here critique, mentioned that until there is description, she thinks of them all as teapots. This may have made us giggle, but upon further reflection it makes perfect sense. How many of you are plagued by teapots in your story? Have a magnificent March everyone. Keep making pages!!! I hadn’t heard the association before. But using my English Major powers, I can deduce that it means all the characters seem the same, like matching tea cups in a set of however many, unless they’re described and given personality that SHOWS how they talk, dress, stand, behave… etc. Otherwise they’re all blank. Which brings up Descriptive Arc, which someone came up with. But I’ll let them do the talking there. Basically though, the writer has to meet the reader mid-way.